When Stephen Vincent Benét died in 1943 at the age of 44, all of America mourned the loss. Benét was one of the country’s most well known poets of the first half of the twentieth century and as a fiction writer, he had an even larger audience. This book is a collection of essays celebrating Benét and his writing. The first group of essays addresses Benét’s life, times, and personal relationships. Thomas Carr Benét reminisces about his father in the first essay, and others consider Benét’s marriage to his wife Rosemary; Archibald MacLeish, Thornton Wilder and Benét as friends, liberal humanists and public activists; and his friendships with Philip Barry, Jed Harris, and Thornton Wilder. The second group contains essays about Benét’s poetry, fiction, and drama. They discuss Benét’s role in the development of historical poetry in America, John Brown’s Body and the Civil War, Hawthorne, Benét and historical fiction, Benét’s Faustian America, the adaptation of “The Devil and Daniel Webster” to drama and then to film, Benét’s use of fantasy and science fiction, and Benét as a dramatist for stage, screen and radio. 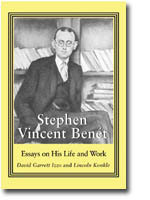 This volume of 11 pro-Benet essays successfully covers all aspects of his life: Benet as member of a Yale Group that also included Thornton Wilder, Philip Barry, Archibald MacLeish, and Jed Harris (who later made a career on Broadway); as husband to Rosemary Carr (who later acted as his collaborator); and as father to Thomas (who later edited the San Francisco Examiner).... Perhaps Benet has lost favor with the reading public because of his irrepressible optimism, his faith that, in spite of horrible setbacks, humanity is making progress. If we can ever recapture that faith in ourselves and our country, Benet's writings will be waiting. Izzo and Konkle have put together a nice collection of 11 essays, four on Benet's life and seven on his work. Despite having died at 45, Benet achieved popular acclaim for his long poem John Brown's Body (for which he won a Pulitzer Prize in 1930), his story "The Devil and Daniel Webster," and other works. He was also the first editor of the "Yale Younger Poets" series. In recent years, Benet has been decanonized, and Izzo and Konkle want readers to rethink Benet's place in literary history. The Benet who emerges in this collection is highly conscious of the US's past, specifically its Civil War, and contemplates the US's role in the world in the 1930s and 1940s. In this regard, he deserves attention, given his long poem, as an American modernist alongside Ezra Pound and T.S. Eliot. And yet Benet's popular appeal in his own time separates him from his expatriate contemporaries. If the purpose of literary criticism is to encourage a renewed interest in primary works, this collection succeeds. Although little of Benet's work remains in print, readers should be thankful for the dusty corners of libraries. Summing Up: Recommended. Lower-division undergraduates through faculty; general readers. All of the subjects in Activists and Activists Between the Wars represent an era, 1919-1941, that became the most world changing in history and thus influenced the rest of the twentieth century. Some of the subjects began to be movers and shakers before the year 1919 and some continued to be long after 1941. Many subjects overlap the years 1919-1941, but all of the subjects were active during those years and contributed to the overall prevailing attitude that linked these subjects together: a need for change. Clarence Darrow will open the volume and while most of his career preceded 1919, his role as a defender of labor carried over to inspire others. Moreover, Darrow's most famous case was the Scopes trial, which took place early in the period here emphasized. Orson Welles closes Volume II and most of his career occurred after 1941; yet, his innovative work with the Mercury Theater and the landmark film Citizen Kane close the era. A collection of twenty-six essays on Auden covering his life and art. A poet's reputation, like the stock market, tends to be unstable. Since Auden's death in 1973, his reputation has gone from a facile poet whose best work was done in the 1930s to--as Izzo says--"the first or second most important twentieth-century poet in English." In this volume of essays, observations, and insights ... Auden's legacy is examined in ways both academic and popular. The academic pieces ... prove most useful.... the nonacademic pieces are both interesting and enlightening. This is a book for young poets to read, as well as those interested in 2Oth-century literature.